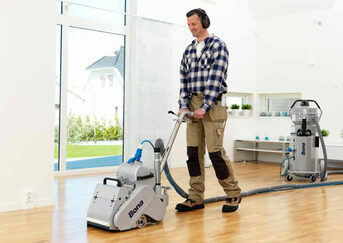 City Sanders, E1 - Affordable Wood Floor Resurface, Professional Restoration. London is blessed with myriad buildings worthy of its history and capital status. Wooden floors - be they boards or blocks - are one of the best-loved and traditional features in its palaces, stately homes and churches. also enjoy them as a valuable asset: clean, attractive, practical, hard-wearing and hygienic. Yet time and feet will take their toll. 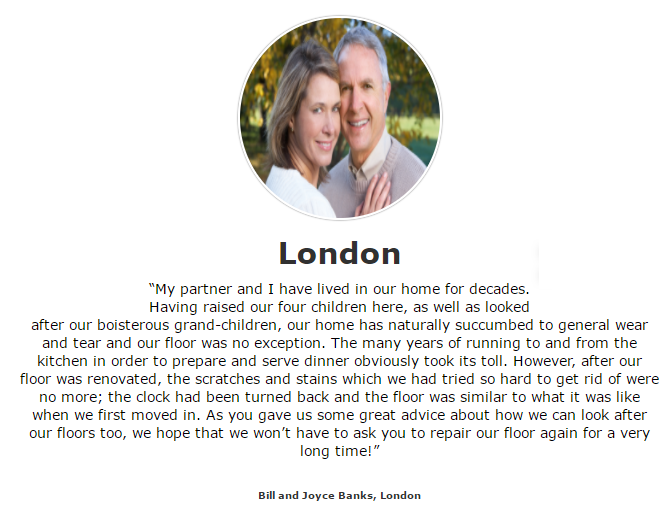 As floors are subject to wear and neglect, they become sad, dull and tired at best - damaged and rotting at worst. City Services will restore your wooden floors to their original glory! Indeed, the results may be of higher quality than when the floor was originally laid down, as sanding techniques and finishing products are now far superior. 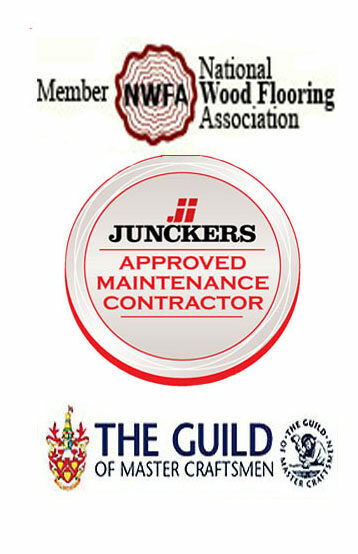 An efficient and friendly firm, City Masters Company work throughout London and the Home Counties. 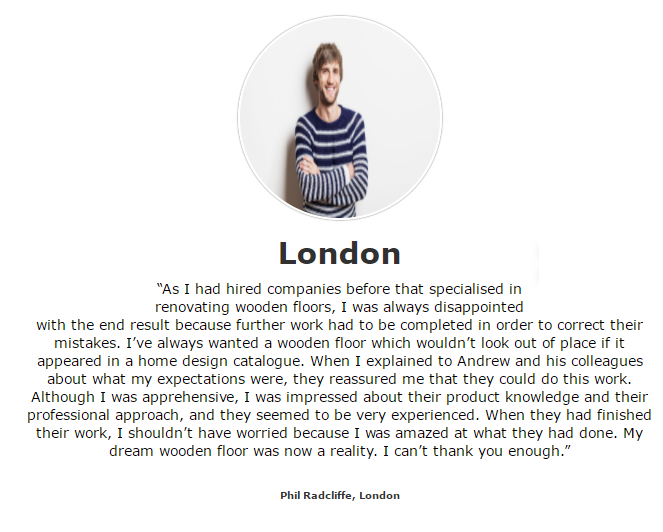 We have restored hundreds of wooden floors - old and new, parquet and boards, domestic and commercial. 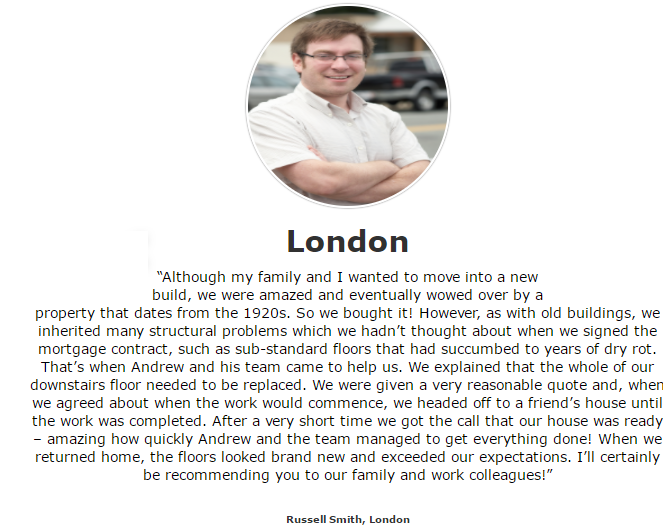 Get in touch today for your free assessment - and take the first steps towards the floors you deserve. Wooden floors decline in appearance over time as the layers of paint and sealant (black wax, oil, varnish or lacquer) wear away. This allows dirt and grime to penetrate the surface. Sanding machines are fitted with special sanding paper of various grades of coarseness. The process comprises three stages: a rough, medium and fine sand to strip, level, and smooth the boards to leave a high quality finish. Sanding is suited to all kinds of wooden floors: hardwood (oak, beech or walnut) or softwood (pine, yew or Douglas fir); engineered floors (hardwood layer over ply); strip floors; herringbone; parquet blocks; mosaic and even cork. The restoration work may include repairing - or replacing - damaged floorboards. Gaps may also be filled. The smooth bare floor can then be stained. A natural stain enhances the original grain of the timber. You can choose a coloured stain when you want to match the floor to the décor of your home or commercial premises. The new floor is finally given a sealant of lacquer, wax or oil – for a beautiful and hard-wearing finish that can last for years. Maybe. 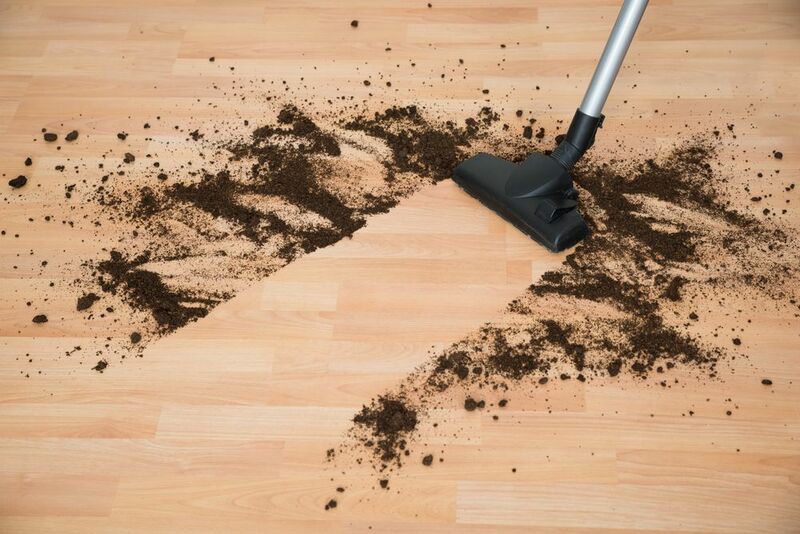 Here's our list of the key ways people ruin a hardwood floor, often without even knowing. Dust can't cause that much damage, can it? Well, you might be surprised. Dust can be pretty abrasive when it's allowed to build up, and when you combine this with dirt, grit and other rougher particles, you've got a recipe for scratching! Giving your wooden floors a good, regular sweep can make the world of difference. Everyone loves a shiny, clean floor, but that doesn't mean the floor loves your cleaner. Indeed, liquid cleaners can actually ruin a hardwood surface if they're over-used. Though most modern wood floors have more tolerance than they used to, you should still avoid using liquid cleaner any more than once every 4-6 weeks. Even then, only use a damp cloth or a mop and work on small areas at a time. Should something so small make such a big difference? Maybe not, but it does! If your exterior door leads right onto the hardwood floor, you need a good mat. The mat will act as a buffer between the great outdoors and that lovely, shiny timber surface, keeping all that muck, dirt and grit away. Rug pads are a great way to stop your gorgeous rug from sliding all over the floor, but you need to be careful which ones you use. Rubber-backed mats can actually dull the wood's shine over time, and can even cause discoloration if left for long enough. 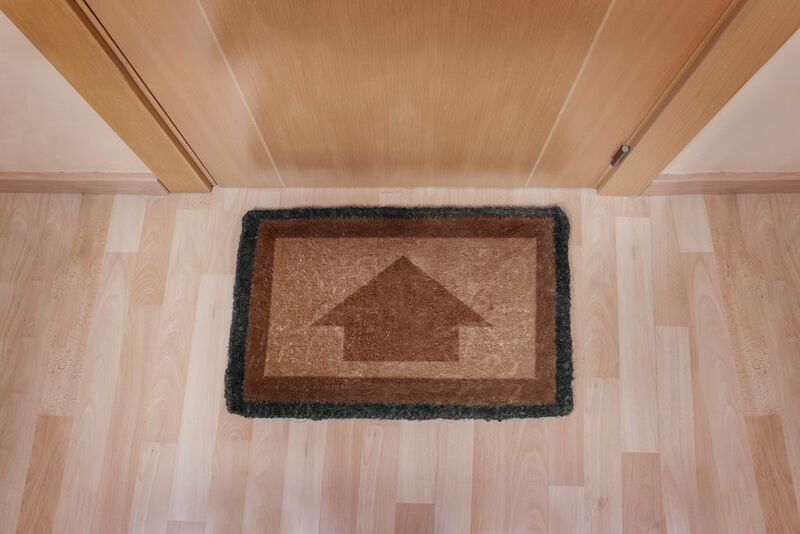 Ensure you pick a rug mat that's a combination of felt and rubber. Make no mistake: high-heels are the enemy of hardwood floors. Stiletto heels are the worst, simply because they're sharper and burrow into the finish as a result. If you want a lovely, dent-free floor, then leave those heels by the door - on a mat!